Four out of five small businesses never sell. Business owners and buyers do not agree on the business selling price and terms. Cash up front: what is the amount of buyer down payment? Is seller and bank financing available on reasonable terms? Does the business offer a living wage for the new owners? Payback period: how long will it take for the buyer to get the down payment money back? Capital expenses: what additional funds are needed to keep the business running? What level of working capital does the buyer need to provide, beyond the business purchase price? Is business cash flow enough to cover the debt service? Reasonable transaction costs that include business licenses and permits, professional fees, due diligence expenses and closing costs. Business cash flow must be sufficient to cover all of the above for the deal to work. With so many “moving parts” in a typical small business sale and purchase negotiation, making sure this is so is no easy task. That’s where ValuAdder Deal Check calculation comes in really handy. You can specify the business selling price and all the terms of a proposed deal. Deal Check shows immediately what level of business cash flow is needed to make the business acquisition work. 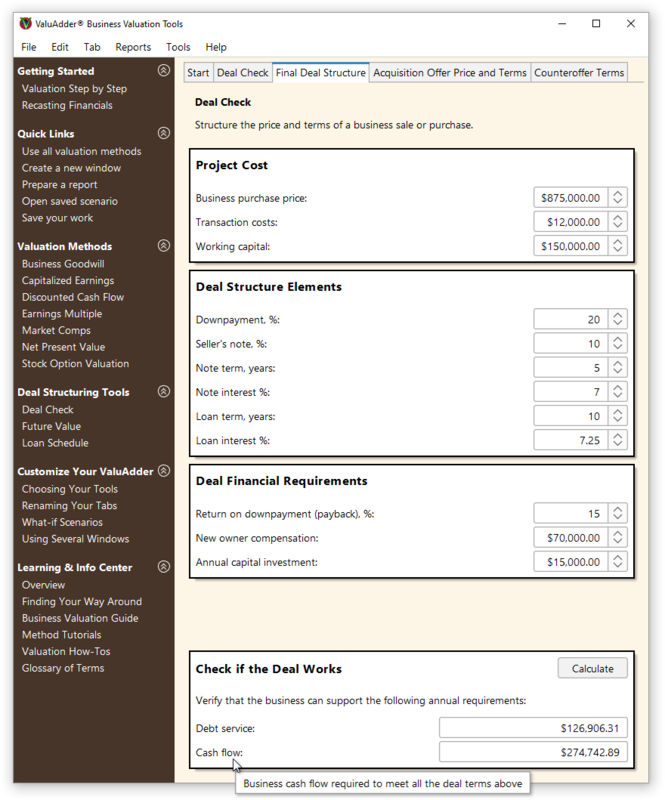 This example shows how you can use Deal Check to find the right business selling price and terms that make the business acquisition a success. First, enter the proposed business selling price. Do not forget to specify adequate working capital needed to run the business in the short term right after the purchase. Transaction costs to close the business sale are another important factor. Next, specify the amount of business buyer down payment and the terms of seller and bank financing. Finally, make sure that the business can provide adequate salary for the new owners, and have cash to cover essential capital expenses such as new equipment purchases. Don’t forget to check how long it takes to get the buyer down payment money back. Varying the terms of the business purchase offer or counter-offer, you can see the effect on the cash flow the business must provide. Do what-if scenarios and use the results for fact-based negotiations to finalize the business acquisition that makes sound financial sense.